One day in 1852 in British-ruled India, a young man burst into an office in the northern Dehra Dun hill town and announced to his boss: "Sir, I have discovered the highest mountain in the world!" After four long and arduous years of unscrambling mathematical data, Radhanath Sickdhar had managed to find out the height of Peak XV, an icy peak in the Himalayas. The mountain - later christened Mount Everest after Sir George Everest, the surveyor general of India - stood at 29,002 feet (8,840 metres). Sickdhar's feat, unknown to many Indians, is now part of the Great Arc Exhibition in London's vibrant Brick Lane. The Indian Government-sponsored exhibition celebrates 200 years of the mapping of the Indian subcontinent. The exercise, which was called "one of the most stupendous works in the whole history of science" was begun by William Lambton, a British army officer, in Madras in 1802. The survey involved several thousand Indians and was named the Great Trigonometrical Survey (GTS) in 1819. It covered more than 1,600 miles and countless people died during the work. Tigers and malaria were the main causes of death. Sickdhar, who was 39 when he made his discovery, was one of the survey's largely unsung heroes. The man from Calcutta was called a "computer" since he worked on computation of data collected by survey parties. He was promoted to the position of "chief computer" because of his good work. "Mathematical skills were essential for Sickdhar's work and he was acknowledged by George Everest as a mathematician of rare genius," British historian John Keay, author of two books on the subject, told BBC News Online. "His greatest contribution to the computation was in working out and applying the allowance to be made for a phenomenon called refraction - the bending of straight lines by the density of the Earth's atmosphere," said Mr Keay. 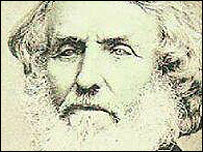 "Like George Everest himself, [Sickdhar] may have never seen [Mount Everest]." It was first identified as a possible contender for the world's highest peak in 1847 when surveyors glimpsed it from near Darjeeling. Several observations were recorded over the next three years by different survey parties. But the announcement that it was the highest - thanks to Sickdhar's efforts - was delayed until 1856 as calculations had to be checked repeatedly. Sickdhar, the son of a Bengali Brahmin, was born in October 1813 in Jorasanko, Calcutta's old city. 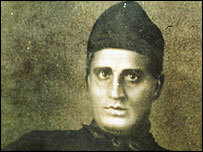 He studied mathematics at the city's renowned Hindoo College and had a basic knowledge of English. A workaholic, Sickdhar never married, instead dedicating his life to knotty mathematical calculations. George Everest was always full of praise for the number-crunching genius. He wrote that Sickdhar was a "hardy, energetic young man, ready to undergo any fatigue, and acquire a practical knowledge of all parts of his profession. "There are a few of my instruments that he cannot manage; and none of my computations of which he is not thoroughly master. He can not only apply formulate but investigate them." 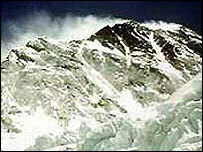 Mount Everest has risen higher since Sickdhar's findings. In 1955, the mountain "grew" by 26 ft to 29,028 ft (or by 8 m to 8,848 m). Mount Everest grew another 7 ft (2 m) in 1999 after researchers analysed fresh data from the mountain. Today, the world's highest mountain stands 29,035 ft (8,850 m) high.